My car accident was almost two years ago. How long do I have to do anything about it? 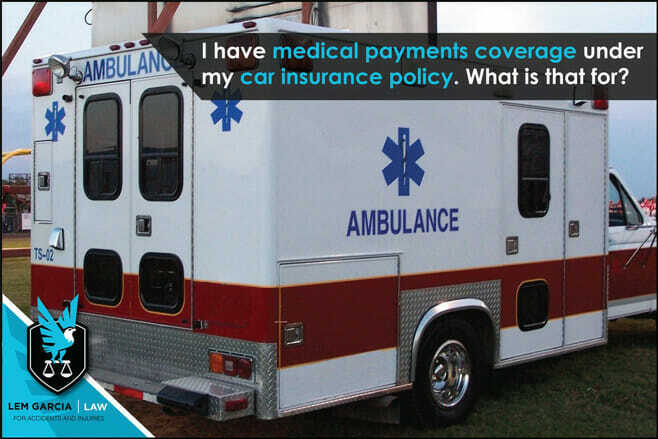 Medical payments coverage under your car insurance policy helps pay for medical bills whether or not you were at fault for the car accident. For example, if you rear-ended someone who was at a complete stop on the freeway and you got injured, then your car insurance company is supposed to pay for your medical bills up to the limits of your coverage. If your ambulance bill and emergency room visit totaled $4,500 and your medical payments coverage was up to $5,000, then your car insurance company should pay for the ambulance bill and emergency room visit. If the car accident was not your fault, and let’s say for example that you were rear-ended on the freeway and were injured, your car insurance company is still supposed to pay for your medical bills up to the limits of your coverage. Again, if your ambulance and emergency room visit totaled $4,500 and your medical payments coverage was up to $5,000, then you car insurance company should pay for the ambulance bill and emergency room visit. In this situation, however, you would have a claim against the party who rear-ended you and you would be able to recover money from the at fault party’s car insurance company. After you recover money from the at fault party’s insurance, your own insurance company will then demand that they get reimbursed for what they paid you for your medical bills because you recovered your medical bills from the at fault party. Your insurance policy most likely contains a clause indicating that your car insurance company will seek reimbursement or subrogation on medical payments made after you recover any money from a third party. If you have not been made whole from the third party recovery, then your car insurance company is required to either waive or reduce their right to recovery. As you can see, it is a battle with the insurance company every step of the way. Even your own car insurance company will try to pay as little as possible for your medical payments and they will try to get reimbursed after you have recovered any money from the third party. If you have health insurance, your car insurance policy may require that you submit your medical bills to your health insurance first before you send the bills to them. This is because your car insurance medical payment policy may be a secondary payer. If this is the case, you will have to submit to your health insurance company and whatever they don’t pay, your car insurance policy is supposed to pay. If you’ve been injured in a car accident, it’s usually best to have your case handled by an experienced personal injury attorney. West Covina car accident attorney, Lem Garcia, can help you with your bodily injury claim and medical payments claim to help make sure that you recover as much as possible.